LIVE JOYFULLY, LOVE WELL & READ! I've fallen off the book bandwagon- even though I was never really on it. Reading was a hobby I appreciated but never made time for. This year I'm turning a new page, actually a lot of them! 2018 ends my reading strike. I want to get lost in the wise words of brilliant men and women. Learn from them, relate to them, and truly enjoy peeling my eyes off a screen and into a good book. One simple step in a movement of self-care. The health of my mind an inspiration will flourish in the reading list I built for the year! When I was young, I thought Alice in Wonderland was called Allison's Wonderland. I also thought Pre-school was pretty school and was so proud to be attending (which is why, I assume, my parents never corrected me.) I was in a happy little world of my own. Just like Alice, I would carry around my book. I chose Little House on the Prairie and would climb up to the lowest branch of the tree in our front yard and crack open the binding of my big beautiful book. I wanted to be smart, sophisticated and darling. But... I was a bookworm fraud! I read the first 4 pages of the first chapter over and over again! My silk bookmark went back and forth until eventually, my book was simply a prop. I loved the idea of getting lost in the exciting and unpredictable world of fiction but actually finding a page-turner was a short-lived search. I stopped looking... until a few months ago! Turns out, I don't love fiction books. I want to be taught, inspired, and enlightened. 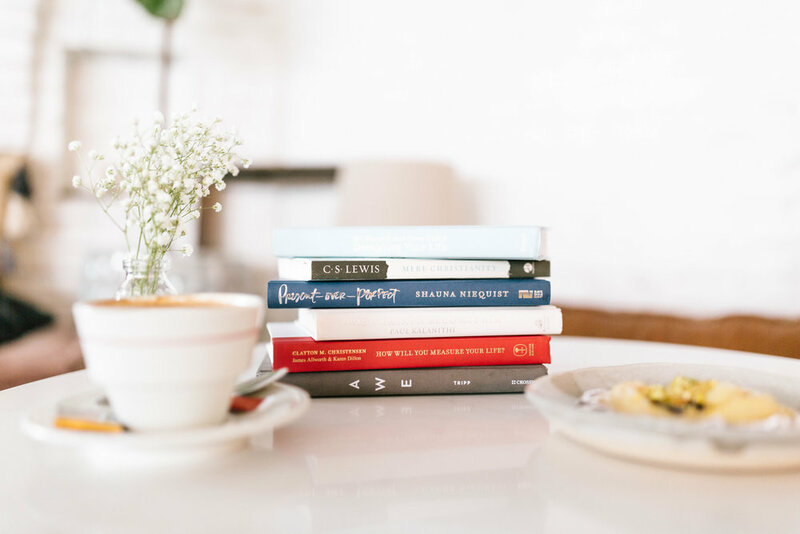 This reading list is tailored to open my eyes and mind to live joyfully, work diligently, find efficiently, and practice presence. Along with a one Christian based fiction trilogy! I've marked this year with a goal of service, but I have to fill myself up in order to pour myself out. Self-care is the first step to serving and reading is one avenue I'm choosing to invest in myself so I can better serve the people around me. HAPPY READING EVERYONE, I HOPE THESE BOOKS LEAD YOU TO A YEAR OF INSPIRATION, JOY, AND LOVE!